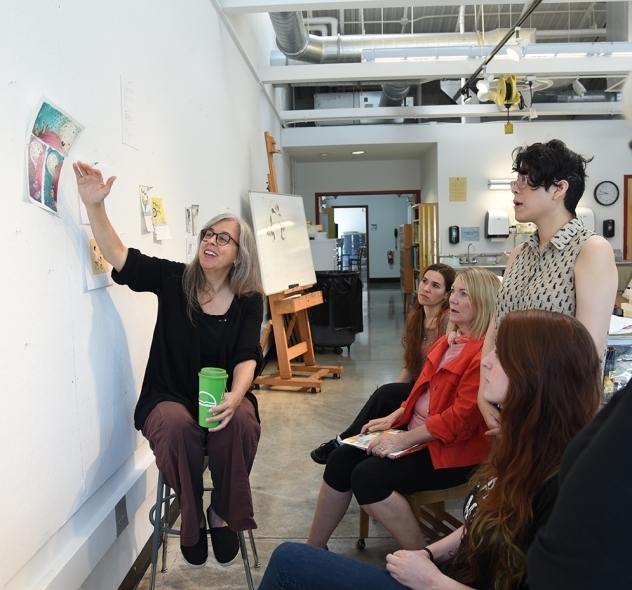 Completed over the course of two summers, the Certificate in Children’s Book Illustration offers working artists and art teachers a program to develop a personal vision and style for tomorrow’s picture book market. Courses explore and improve students’ art skills and knowledge of picture book fundamentals with studio practice and an in-depth study of both past and contemporary picture book illustrators. Students undertake four courses of six credits each over two six-week summer terms. The first summer, they take Children’s Book Drawing Fundamentals and Intro To Children’s Book Media. Children’s Book Design and Children’s Book Portfolio are taken in the second summer. Intro to Children’s Book Media covers both traditional and digital media, as well as the medium of words— in the form of a picture book manuscript and book dummy. Certificate credits fulfill much of the Illustration component of the M.F.A. in Children’s Book Writing and Illustrating, and may also be counted toward that degree. Courses explore and improve students’ art skills and knowledge of picture book fundamentals. An in-depth study of both past and contemporary picture book illustrators informs them. Students undertake four courses of six credits each over two six-week summer terms. The first summer, they take Picture Book Drawing Fundamentals and Creating Picture Books for Children. Picture Book Design and Picture Book Media are taken in the second summer. Creating Picture Books for Children also includes the writing of picture book manuscripts as well as creating storyboards and book dummies. Ashley Wolff is the author and/or illustrator of over 50 children’s picture books. Runs concurrently with the certificate program. 2019 summer term: $830 per credit hour. The Hollins University Graduate Center is happy to answer your questions.